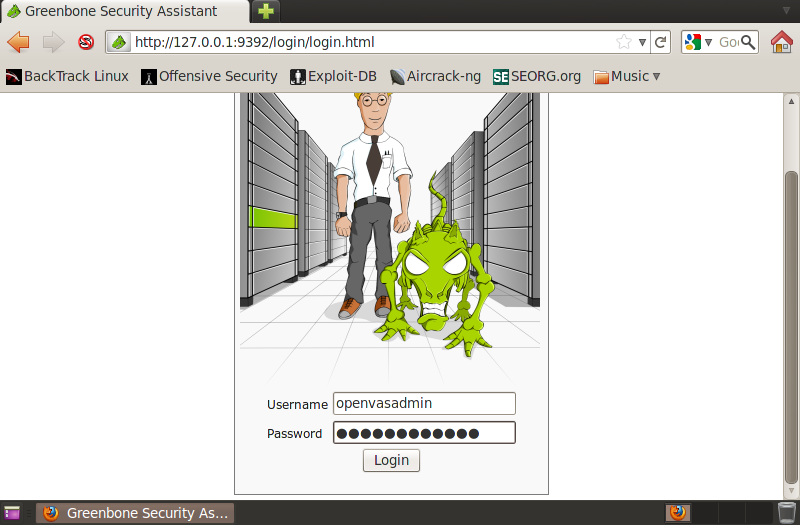 OpenVAS stands for Open Vulnerability Assessment System. It is the collection of several tools and services which offers vulnerability scanning and management solution. OpenVAS is free and it is licensed under GPL (GNU General Public License). Lets start with the step by step guide on installing and configuring the OpenVAS in linux machine. Here we prefer backtrack to configure the OpenVAS. Open the Terminal and install openvas by typing the bellow command. After install perform the registry update with the bellow mentioned command. After installing OpenVAS you’ll find it installed at the Application menu on top. After that click on openvas Check Setup. It will check for problems with installation and provides effective solutions for it. add user and set rule if required. also set the password for user. Now click on OpenVAS NVT Sync to synchronize an NVT collection with OpenVAS NVT feed. It’ll download latest plugins from NVT. Now start OpenVAS Scanner and it’ll loads the required plugins. Now open the OpenVAS Mkcert to create the SSL certificate. type openvasmd –rebuild to changes to be effective. Now you are done and you can access the Greenbone Security Assistant from the browser by typing the url http://127.0.0.1:9392 and give your username and password. Thanks for reading. Comment below to state your views.